VNLC works as a collaborator as well as a hired consultant or researcher for governmental agencies, private landowners, small businesses, corporations, conservation groups, and land trusts. We take pride in our ability to communicate effectively with ranchers and farmers as well as government regulators, conservation advocates, and developers. Through our projects, we have helped establish more than 80,000 acres of conservation lands throughout California, and have developed and implemented restoration, management, and monitoring plans on numerous public and private preserves covering many thousands of acres. We are involved in a number of prominent research studies in California and abroad. Examples include a study of the breeding dynamics of California tiger salamander in the eastern San Joaquin Valley, re-introduction of the critically endangered large-flowered fiddleneck within its historical range around and south of Mt. Diablo (on private as well as public lands), the development of predictive habitat modeling for rare vernal pool plants and animals in the Great Valley, a large-scale comparative study of created versus natural vernal pool wetlands in the Sacramento Valley, and the classification and mapping of plant communities within a threatened wildlife corridor in northeast Tanzania, Africa. Our team is particularly recognized for its expertise related to vernal pools, native and non-native grasslands, scrub/chaparral habitats, oak savanna/woodland, riparian habitats, and alkali sink scrub and wetlands; rare plant and wildlife species associated with these habitats; modern techniques for vegetation mapping and classification; and the process for establishing, managing, and monitoring mitigation and conservation lands. We possess federal and state survey permits for California red-legged frog, California tiger salamander, listed vernal pool shrimp, and federal and state listed plants. We have conducted status surveys and regional population and conservation assessments for several listed species, developed pioneering conservation and restoration techniques for selected habitats and species, and contributed baseline data to regional conservation plans, recovery plans, and periodic listed species reviews. We collaborated with CDFW and the California Native Plant Society in developing a vegetation map of the entire southern Sierra foothill region. We have established several high-profile mitigation banks and preserves including an ‘in-house’ mitigation bank for Caltrans, a ‘turn-key’ mitigation preserve for the first leg of the California High Speed Rail project, and the first (and only) conservation bank in Santa Barbara County for a locally endemic endangered race of the California tiger salamander. Our team takes an integrative, ecological approach to projects, combining our specialized skills to analyze and interpret ecosystems at both landscape and local scales. We have extensive experience working on large, ecologically diverse project sites. We own 4×4 vehicles and a fleet of ATVs, are experts in remote analysis and mapping, and have well-developed methods for safely coordinating survey teams over large areas and rugged terrain. We employ the most contemporary scientific methods and technology in our surveys and analyses, including the most advanced data collection hardware and software. Our office equipment includes top-level GIS software, high-quality plotters and 11”x17” color laser printers. 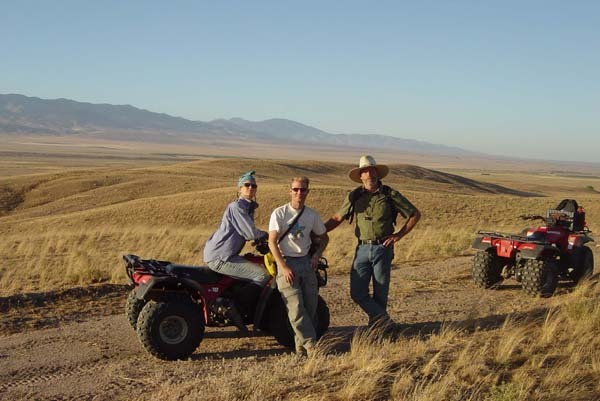 Our field equipment includes 4×4 vehicles, ATVs, professional GPS units, water quality sampling instruments, laser transits, field laptop computers and iPads, and a variety of field sampling equipment.